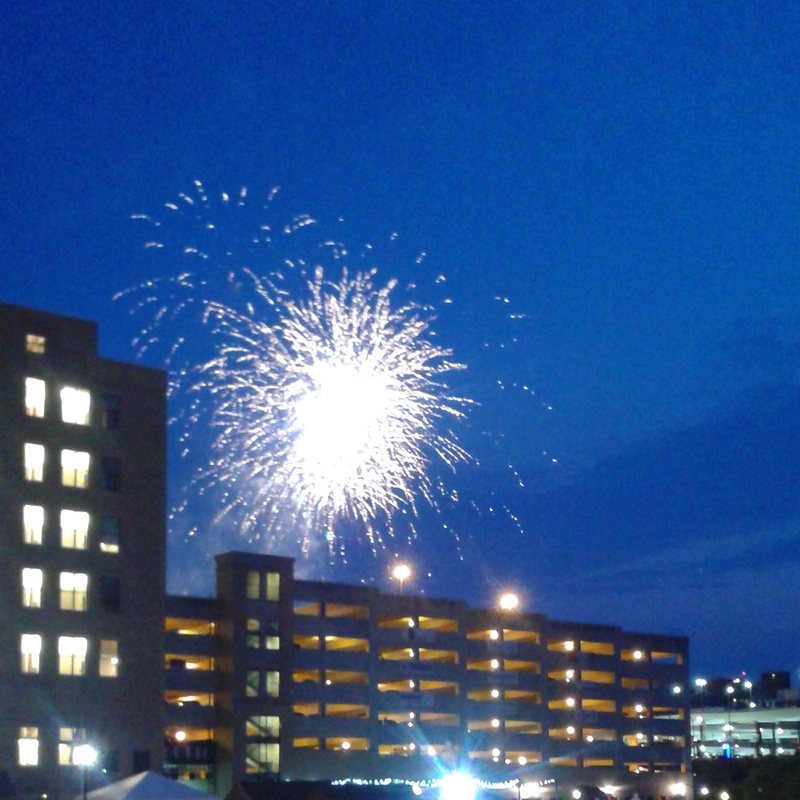 Rib, White and Blue is held in downtown Akron every July. 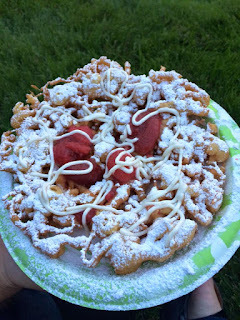 This year the festival took place July 1, 2, 3 and 4. Parking is available all over the city including in some of the free public lots and for a small price the University of Akron parking decks which are near the area. Although it might seem kind of odd for a vegetarian to attend a rib festival, I was pleasantly surprised by the food options that were available to me. There was cole slaw, macaroni and cheese, corn bread and even some BBQ mushroom options. We arrived around 4:30 p.m. on Friday and the festival wasn't too crowded, try to go for an off peak time, around 6:00 p.m. it was difficult to walk around or to find places to sit and eat BBQ. 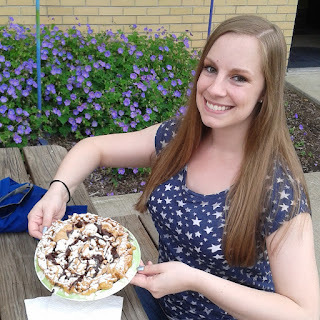 Once we munched on some BBQ favorites, I was drawn to the funnel cake vendor who was selling funnel cakes with a variety of fun toppings. 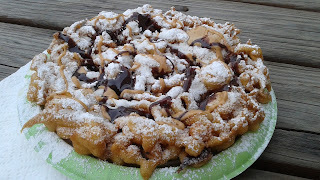 I enjoyed a peanut butter and chocolate topped funnel cake, my friends enjoyed a strawberry cheese cake topped funnel cake. If you thought funnel cake was amazing before, they are even better with toppings. All of the restaurants downtown were bustling with people, the festival had a beer vendor, but if you're looking for a different type of alcoholic beverage, you'll need to swing by a restaurant for a quick drink. The night we were there a Fleetwood Mac cover band was playing on the main stage. This view from the festival shows the crowd rocking out at Lock 3. Due to the large crowd near the band we settled in at the top of a hill right near the edge of the rib vendors. From that location we were able to check out the fireworks which were set off at the end of the Rubber Ducks game. This is a pretty food centered festival, so although admission is free, you should bring some cash. Some vendors did have Square and were able to take credit cards, but the majority of vendors were cash only. Depending on what you were ordering and how much you wanted to eat prices ranged from a few dollars to twenty-five dollars (that price stands out in my mind because the meal was called the "Vegetarian's Nightmare" it was a 1/2 rack of ribs + a 1/4 of a chicken). Aside from the band, there wasn't too much to do other than eat and near the end of the night the festival was incredibly crowded. Overall we had a fun time, but if you plan on staying for fireworks, you should arrive a little later or you might run out of something to do.